Synthetic peptide within Human PD-L1 aa 250 to the C-terminus. The exact sequence is proprietary. ab226766 is a PBS-only buffer format of ab228415. Please refer to ab228415 for recommended dilutions, protocols, and image data. Clone 73-10 is also known as clone MKP1A07310. Clone 73-10 has been tested within Blueprint Phase 2 project. ab226766 (PD-L1 clone 73-10) is a catalogue antibody for Research Use Only. Not for use in diagnostic procedures. Our Abpromise guarantee covers the use of ab226766 in the following tested applications. Immunohistochemistry (Formalin/PFA-fixed paraffin-embedded sections) analysis of human tonsil tissue labelling PD-L1 with ab228415 at a dilution of 1:2500. Heat mediated antigen retrieval was performed using AR9 antigen retrieval solution, and microwave treatment for 15 min at 20% power. Anti-Rabbit/Mouse HRP polymer (Vector Labs) was used as secondary antibody. Opal tyramide amplification was performed using Opal 520 fluorophore. Counterstained with DAPI stain. Image scanned with Vectra 3.0 and analyzed via software. This data was developed using the same antibody clone in a different buffer formulation containing PBS, BSA, glycerol, and sodium azide (ab228415). IHC image of ab228415 staining PD-L1 in human tonsil formalin fixed paraffin embedded tissue sections*, performed on a Leica BOND RX (standard Protocol F, Polymer Refine kit). The section was pre-treated using heat mediated antigen retrieval with EDTA buffer (pH9, epitope retrieval solution 2) for 30 mins at 98°C. The section was then incubated with ab228415, 0.06μg/ml working concentration, for 15 mins at room temperature and detected using an HRP conjugated compact polymer system for 8 minutes at room temperature. DAB was used as the chromogen for 10 minutes at room temperature. The section was then counterstained with hematoxylin, blued, dehydrated, cleared and mounted with DPX. IHC image of ab228415 staining PD-L1 in PD-L1 Dynamic Range Analyte Control formalin fixed paraffin embedded cell lines (HistoCyte Laboratories), performed on a Leica BOND RX (standard Protocol F, Polymer Refine kit). The section was pre-treated using heat mediated antigen retrieval with EDTA buffer (pH9, epitope retrieval solution 2) for 30 mins at 98°C. The section was then incubated with ab228415, 0.06μg/ml working concentration, for 15 mins at room temperature and detected using an HRP conjugated compact polymer system for 8 minutes at room temperature. DAB was used as the chromogen for 10 minutes at room temperature. The section was then counterstained with hematoxylin, blued, dehydrated, cleared and mounted with DPX. Immunohistochemistry (Formalin/PFA-fixed paraffin-embedded sections) of Human placenta stainging PD-L1 with ab228415 at 1/500 dilution. Heat mediated antigen retrieval using Bond™ Epitope Retrieval Solution 2 (pH 9.0) for 10 mins. The section was incubated with ab228415 for 10 mins at room temperature. 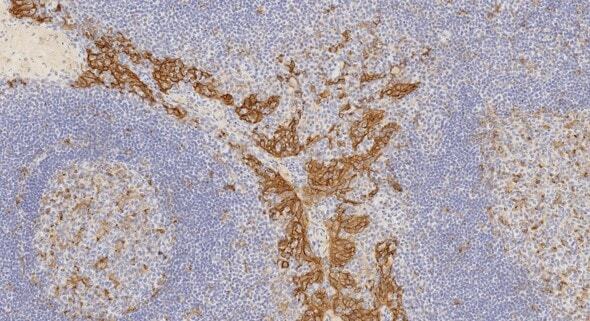 The secondary antibody used was ready to use Rabbit specific IHC polymer detection kit HRP/DAB (ab209101). Counter stained Hematoxylin. Performed on a Leica Biosystems BOND® RX instrument. Immunohistochemistry (Formalin/PFA-fixed paraffin-embedded sections) of Human lung carcinoma stainging PD-L1 with ab228415 at 1/500 dilution. Heat mediated antigen retrieval using Bond™ Epitope Retrieval Solution 2 (pH 9.0) for 10 mins. The section was incubated with ab228415 for 10 mins at room temperature. The secondary antibody used was ready to use Rabbit specific IHC polymer detection kit HRP/DAB (ab209101). Counter stained Hematoxylin. Performed on a Leica Biosystems BOND® RX instrument. Immunohistochemistry (Formalin/PFA-fixed paraffin-embedded sections) of Human tonsil stainging PD-L1 with ab228415 at 1/500 dilution. Heat mediated antigen retrieval using Bond™ Epitope Retrieval Solution 2 (pH 9.0) for 10 mins. The section was incubated with ab228415 for 10 mins at room temperature. The secondary antibody used was ready to use Rabbit specific IHC polymer detection kit HRP/DAB (ab209101). Counter stained Hematoxylin. Performed on a Leica Biosystems BOND® RX instrument. Immunohistochemistry (Formalin/PFA-fixed paraffin-embedded sections) - Anti-PD-L1 antibody [73-10] - BSA and Azide free (ab226766)Image from Tsao MS et al., J Thorac Oncol. 2018;13(9):1302-1311. Fig 3.; 10.1016/j.jtho.2018.05.013 with permission from Elsevier. Immunohistochemistry (Formalin/PFA-fixed paraffin-embedded sections) of lung cancer tissue samples. Comparing the staining PD-L1 with different monoclonal antibodies. ab228415 (73-10) showed higher sensitivity to PD-L1 compared to the other clones. For further details on this image please see PubMed ID: 29800747. Immunohistochemistry (Formalin/PFA-fixed paraffin-embedded sections) - Anti-PD-L1 antibody [73-10] - BSA and Azide free (ab226766)Image from Silva MA et al., PLoS One. 2018;13(6):e0196464. Fig 3(B). ; 10.1371/journal.pone.0196464. 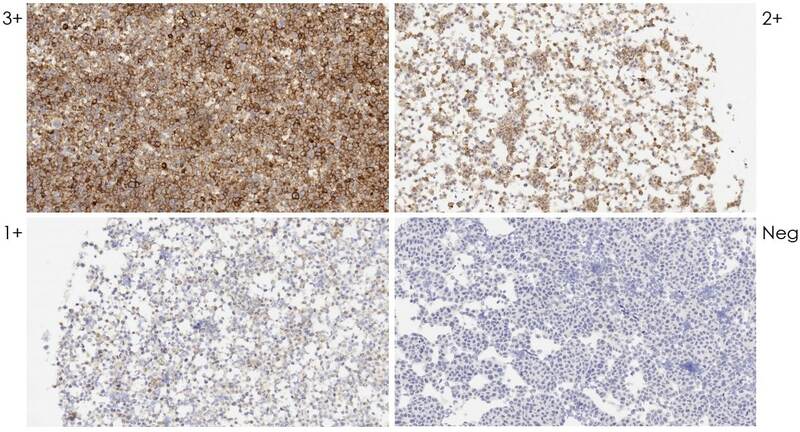 Immunohistochemistry (Formalin/PFA-fixed paraffin-embedded sections) Staining PD-L1 in human non-small cell lung cancer tissue with >50% PD-L1-positive tumor cells were compared with tissue with lower PD-L1 expression using ab228415 at 0.25μg/ml incubated for 30 minutes at room temperature. Antigen Retrieval was done with Target Retrieval Solution, high pH. Detection was done with EnVision FLEX/HRP. Hematoxylin EnVision FLEX was used as a counter stain. Immunohistochemistry (Formalin/PFA-fixed paraffin-embedded sections) - Anti-PD-L1 antibody [73-10] - BSA and Azide free (ab226766)Image from Silva MA et al., PLoS One. 2018;13(6):e0196464. Fig 4.; 10.1371/journal.pone.0196464. Immunohistochemistry (Formalin/PFA-fixed paraffin-embedded sections) Staining PD-L1 in human non-small cell lung cancer tissue using ab228415 at 0.25μg/ml incubated for 30 minutes at room temperature. Antigen Retrieval was done with Target Retrieval Solution, high pH. Detection was done with EnVision FLEX/HRP. Hematoxylin EnVision FLEX was used as a counter stain. A: Diffuse expression of PD-L1 (IHC) on tumor cell membranes of a squamous cell carcinoma, including central regions of trabeculae. Prominent labeling of cells in the TME compartment at the tumor-nest-TME interface suggesting presence of an immunological synapse (inset arrow). C: No to minimal PD-L1 expression in both tumor and TME compartments in an adenocarcinoma. D: Diffuse expression of PD-L1 by tumor-nests in an adenocarcinoma with minimal TME staining. F: TME expression only. No to minimal PD-L1 expression in tumor cells of a squamous cell carcinoma, with widespread staining in the TME compartment. Immunofluorescent analysis of 4% paraformaldehyde-fixed, 0.1% Triton X-100 permeabilized CHO-PD-L1 (PD-L1 stably expressed Chinese hamster ovary epithelial cell) cells labeling PD-L1 with ab228415 at 1/200 dilution followed by Goat Anti-Rabbit IgG H&L (Alexa Fluor® 488) (ab150077) secondary antibody at 1/1,000 dilution (green). Confocal image showing membranous staining on CHO-PD-L1 cells. Secondary antibody only control: Used PBS instead of primary antibody, secondary antibody is Goat Anti-Rabbit IgG H&L (Alexa Fluor® 488) (ab150077) secondary antibody at 1/1,000 dilution. PD-L1 was immunoprecipitated from 0.35 mg of NCI-H1975 (human non-small cell lung cancer cell line) whole cell lysate with ab228415 at 1/30 dilution. Western blot was performed from the immunoprecipitate using ab228415 at 1/1,000 dilution. VeriBlot for IP secondary antibody (HRP) (ab131366), was used as secondary antibody at 1/5,000 dilution. Lane 1: NCI-H1975 whole cell lysate 10 µg (Input). Lane 2: ab228415 IP in NCI-H1975 whole cell lysate (+). Lane 3: Rabbit monoclonal IgG (ab172730) instead of ab228415 in NCI-H1975 whole cell lysate (-). Flow cytometric analysis of 4% paraformaldehyde-fixed, 90% methanol-permeabilized CHO-PD-L1 (PD-L1 stably expressed Chinese hamster ovary epithelial cell, Red) / CHO-S (Chinese hamster ovary epithelial cell, Blue) cell lines labeling PD-L1 with ab228415 at 1/100 dilution (red). Goat Anti-Rabbit IgG H&L (Alexa Fluor® 488) (ab150077) at 1/2000 dilution was used as the secondary antibody. Immunohistochemical analysis of paraffin-embedded human tonsil tissue labeling PD-L1 with ab228415 at 1/5000 dilution. The tissue was incubated with ab228415 at 4? overnight, followed by Rabbit specific IHC polymer detection kit HRP/DAB (ab209101) ready to use. Cytoplasmic and membranous staining in human tonsil is observed. Counter stained with hematoxylin. Secondary antibody only control: Used PBS instead of primary antibody, secondary antibody is Rabbit specific IHC polymer detection kit HRP/DAB (ab209101). Antigen retrieval: Universal HIER antigen retrieval reagent (10X) (ab208572). Immunohistochemical analysis of paraffin-embedded human lung carcinoma tissue labeling PD-L1 with ab228415 at 1/5000 dilution. The tissue was incubated with ab228415 at 4? overnight, followed by Rabbit specific IHC polymer detection kit HRP/DAB (ab209101) ready to use. Membranous and weakly cytoplasmic staining in human lung carcinoma (PMID: 23460533) is observed. Counter stained with hematoxylin. Immunohistochemical staining of PD-L1 in formalin-fixed, paraffin embedded Formalin-fixed, paraffin-embedded reference standard with negative (-), low positive (+), intermediate positive (++) and strong positive (+++) controlled protein expressing cell lines (‚CD274 (PD-L1) Expression IHC Reference Standard‘, catalog ID HD787, horizon) using clone 73-10 [ab228415] at a dilution of 10μg/ml. Incubate for 30 minutes at 37°C. Heat mediated antigen retrieval in sCC1 (Tris/EDTA buffer, pH 8). Signal detection with BenchMark XT from Roche/Ventana and ultraView Universal DAB Detection Kit. Immunohistochemical analysis of paraffin-embedded human placenta tissue labeling PD-L1 with ab228415 at 1/5000 dilution, followed by Rabbit specific IHC polymer detection kit HRP/DAB (ab209101) ready to use. Membranous and cytoplasmic staining in human placenta (PMID: 12538684) is observed. Counter stained with hematoxylin. ab226766 has not yet been referenced specifically in any publications. Publishing research using ab226766? Please let us know so that we can cite the reference in this datasheet. There are currently no Customer reviews or Questions for ab226766.